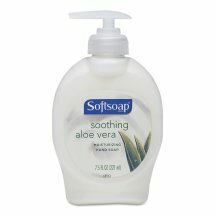 Hand Soap, Moisturizing, Soothing Aloe VeraWowerful. Trust the clean. Wow your senses. Give your hands the soothing experience of aloe vera that keeps your hands feeling moisturized and clean. Recyclable bottle. www.softsoap.com. Water, Sodium C14-16 Olefin Sulfonate, Lauramide Dea, Glycol Stearate, Sodium Chloride, Cocamidopropyl Betaine, DMDM Hydantoin, Fragrance, Polyquaternium-7, Citric Acid, Tetrasodium EDTA, Glycerin, Aloe Barbadensis Leaf Juice, Hydrolyzed Silk.